The Office of Naval Research has spent years developing a robot to take on every sailor's worst nightmare — fire aboard their vessel. 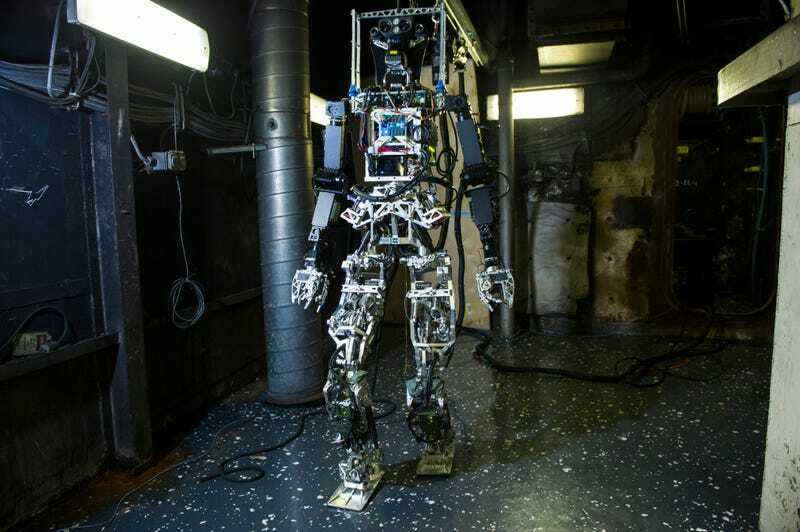 The bipedal Shipboard Autonomous Firefighting Robot (SAFFiR), has a human form so that it can navigate the tight spaces of a ship. One day it may lead damage teams into shipboard infernos or even get the Captain coffee. Like so many other emerging robotics concepts, SAFFiR remains largely a man-in-the-loop concept, capable of some basic autonomous tasks but requiring an operator's oversight at all times. Eventually it will become a much more autonomous systems so that it can integrate into 'hybrid' human-robotic teams, using hand motions and voice commands to execute more complex assignments. Although firefighting is the objective for SAFFiR and its enabling sub-systems, clearly this technology can evolve into much, much more. Having an android that can navigate on its own around the complex interior of a ship, and even into damaged areas filled with smoke and overwhelming heat, means that once it gains some sort of autonomy it could be used to do a whole number of tasks, some as lowly as courier. Beyond that, the robotics concepts behind SAFFiR could be applied to the civilian market, not just for firefighting, but for a myriad of tasks. When combined with emerging 3D virtual reality goggle technology, SAFFiR-like droids could even provide virtual presence, giving everyone from paraplegics to soldiers a way to remotely go about their business with human like mobility but at no risk of bodily injury. Because of SAFFiR's unique laser ranging, 3D and thermal imaging systems that it uses to navigate, it could also use these advanced capabilities to constantly measure and document the world around it. In doing so, it could detect slight but important changes to its usual environment that no human could detect without knowing an issue exists in the first place. For instance, if a passageway on a ship changes in measurements slightly over time, SAFFiR could be programmed to alert its operators. In this way it could identify potentially catastrophic structural issues before they start. It could even sense heat buildup in conduits or other systems that are out of the ordinary, thus potentially stopping a fire before it even happens. Passive observation concepts like this that use a robot's navigational sensors on secondary tasks such a taking detailed recordings of its environment and comparing those recordings with past ones to see discrepancies, could result in drones on every deck of a ship or in every floor within a building. Sure they can go deliver documents down the hall, or even bring the Captain or CEO a hot cup of coffee, but while they are doing those tasks they can also take extra-human notes on their surroundings and can turn from a metallic girl-Friday to point man firefighter in a moment's notice should a disaster occur. These types of droids could also be used in places like nuclear plants, going where humans simply cannot go, to observe and manipulate objects at will. They could even be used in the manufacture of things like aircraft, where a robotic machinist's assistant does not only hold things for them or runs and gets them tools, but also verifies their work passively using highly sensitive measuring instruments. Because SAFFiR is a research and evaluation program more than anything else, it has evolved over its lifespan, incorporating new technologies and concepts. One of the them is the use of micro-drones to act as the eyes for search and rescue and damage control teams. These quadcopter-like unmanned systems are clearly viable for the shipboard environment as they can float down the tight corridors and ladder ways found on Navy vessels. In addition, they can venture into environments where crew cannot, or can but only at very high risk. By using these maneuverable little copters as scouts, it allows for personnel to only risk entering areas where lives can be saved and/or where the challenges of doing so are known in advance. Humanity is getting closer and closer to a time when we will integrate our daily tasks with robots, and androids are so enticing because they can work easily in a world humankind has shaped for itself. The ability for such machines to one day execute today's most dangerous and mundane jobs will change the way we work, fight and live on a daily basis. Even that party robot you have wanted since the 1980s will be a real possibility. But before that, they will probably be dousing fires on the Navy's most advanced combat ships.